Stucco's a lot of things, but it's not invincible. If and when it becomes damaged due to moisture, use the following procedure to patch the area in need of repair. Stucco is a wonderfully versatile wall treatment—durable, weather-resistant, and attractive. It’s been used in countless different applications, both indoors and out. Today, however, it mostly appears on home exteriors, where, like any material exposed to the weather, it requires periodic maintenance. 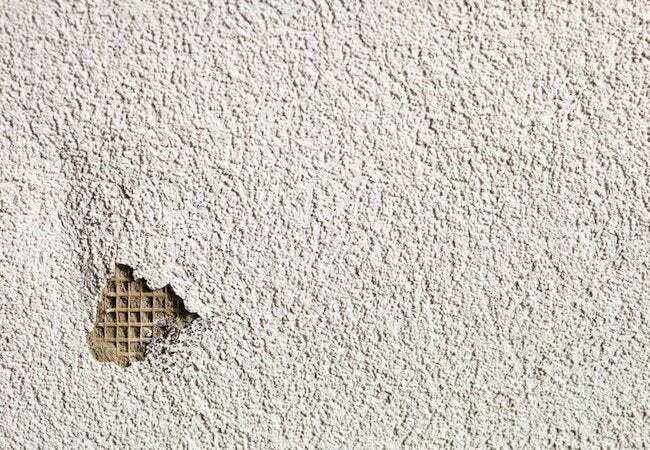 If you see cracks developing, use a chisel and hammer to chip away the loose stucco. Once you’ve done so, check the wire mesh beneath the stucco. If it’s damaged, cut a new piece and use galvanized nails to fasten it in place. Now, mix a batch of stucco patching compound and use a small trowel to work it into the hole you’ve chiseled. Next, run a flat board across the patch and surrounding area to ensure that they’re level with one another. With the patch still moist, use a finishing tool to make the texture match the rest of the wall. For smooth finishes, a trowel works best. For stippled textures, a sponge. Copying a swirled effect? Try a whisk!